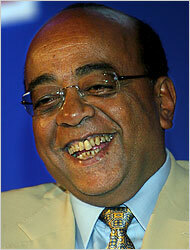 Billionaire entrepreneur Mo Ibrahim. Source of photo: online version of the NYT article cited below. At a news conference in London on Thursday, Mo Ibrahim, a 60-year-old Sudanese-born billionaire who made his money in the cellphone business, announced that he was offering a $5 million prize for the sub-Saharan African president who on leaving office has demonstrated the greatest commitment to democracy and good governance. The money will be spread out over 10 years. Unlike many projects that aim to help famine-stricken villages or far-flung AIDS clinics, this one is supposed to focus on political leadership — and the post-independence culture of autocrats and kleptocrats that spawned such figures as Mobutu Sese Seko of Zaire or Idi Amin of Uganda. “We want them to have a life after office,” Mr. Ibrahim said. “Your leaders here become rich after they leave office,” he said, referring to the directorships, book deals and lecture circuit tours that accrue to Western leaders. “What life is there for our people after office? Some of our leaders cannot even afford to rent an apartment” in their own capitals, he said. 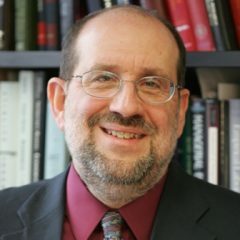 ALAN COWELL "Prize to Honor Heroes in African Democracy." The New York Times (Fri., October 27, 2006): A11.